$ 185.00 for lg. 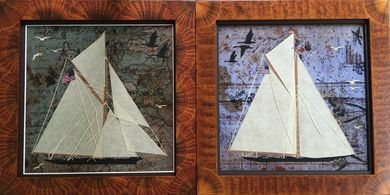 original, 43. for framed print 6 x 6"
Ship #1-Thistle, 1887 Ship #2--Shamrock II, 1901. Eleventh challenger Irish 137', 14,027 ft. of sail. Colombia outsailed her. Owner Sir Thomas Lipton of Royal Ulster Yacht Club. America's Cup races.